A light bulb made with graphene - said by its UK developers to be the first commercially viable consumer product using the super-strong carbon - is to go on sale later this year. The dimmable bulb contains a filament-shaped LED coated in graphene. It was designed at Manchester University, where the material was discovered. The National Graphene Institute at the university was opened this month. The light bulb was developed by a Canadian-financed company called Graphene Lighting - one of whose directors is Prof Colin Bailey, deputy vice-chancellor at the University of Manchester. It is expected to be priced lower than some LED bulbs, which can cost about £15 each. 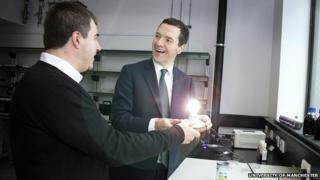 Prof Bailey told the BBC: "The graphene light bulb will use less energy. We expect it to last longer. The manufacturing costs are lower and it uses more and more sustainable components." A micro-thin layer of graphene is stronger than steel and it has been dubbed a "wonder material" because of its potential uses. The government has invested £38m in the National Graphene Institute via the Engineering and Physical Sciences Research Council, with an additional £23m provided by the European Regional Development Fund. Chancellor George Osborne, who opened the site on 20 March, has said he hopes the UK can see off competition from China and South Korea to become a centre of excellence in graphene technology. More than 35 companies worldwide have already partnered with the university to develop projects. The race is now on to develop other practical and commercial uses, including lighter but more robust car and aircraft frames and false teeth. The material has already been incorporated into products including tennis rackets and skis.